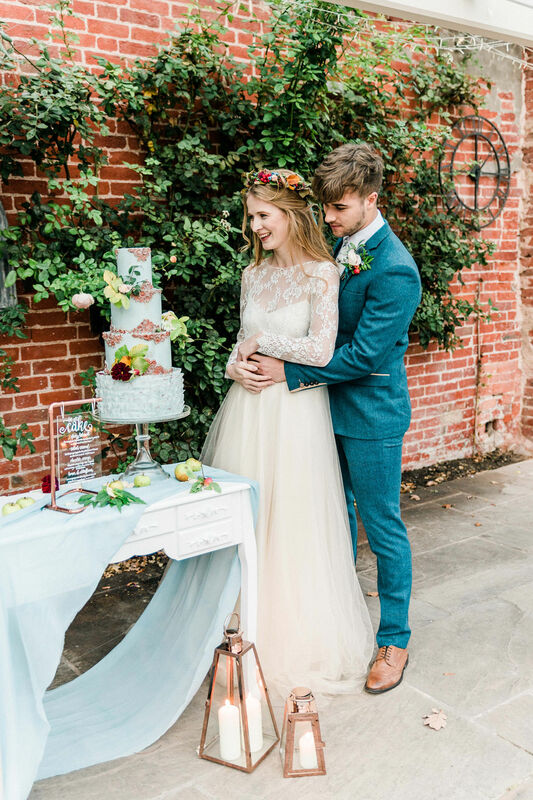 A few months ago, Lorien from Storeybook Cakes asked me if I would help her to plan and style a shoot that she had in mind. I love Lorien’s work and when I saw the mood board she had created, I was really keen to get involved. 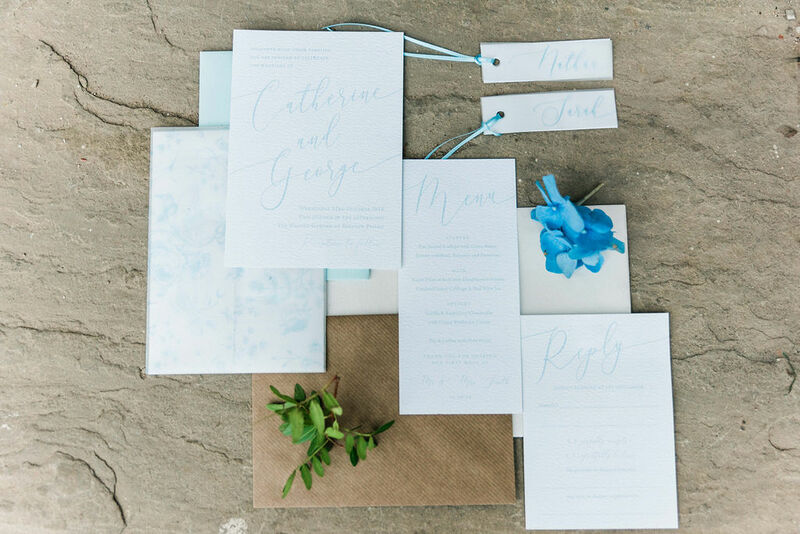 As soon as I saw the mood board, I realised that Emily Olivia Photography needed to photograph the shoot. 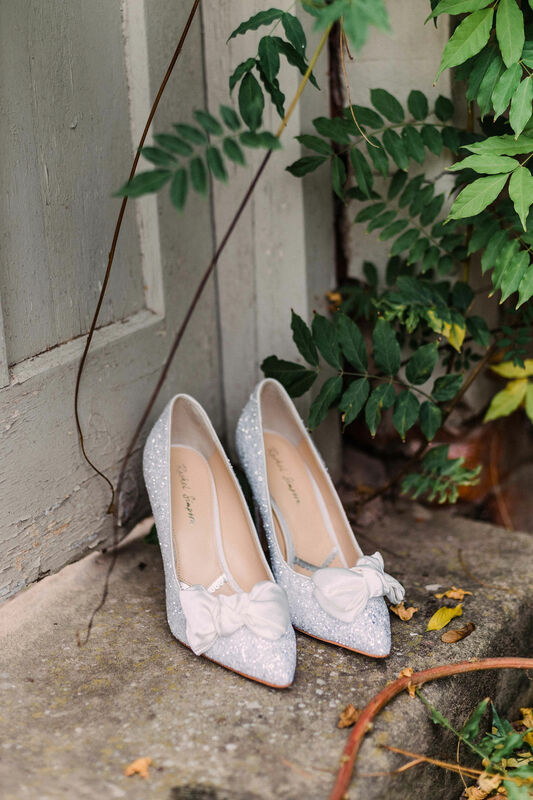 Emily’s light and airy style of photographs is perfect for the style we had in mind. 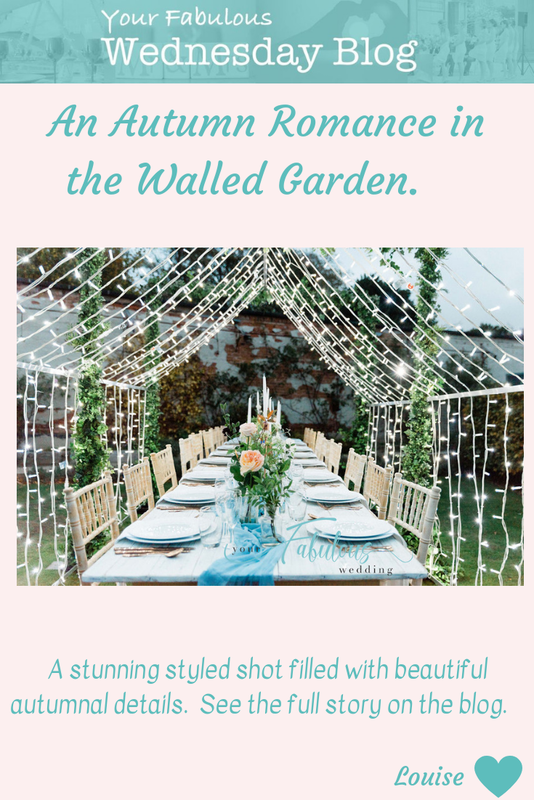 I went to visit the venue – the Walled Garden at Beeston Fields – to talk to them about the possibility of holding the shoot there. When I saw the garden, I knew it was the right spot for what we had in mind. You can see my blog about the venue here. The gardens are beautiful with so many hidden corners making for the perfect backdrop for the gorgeous images. 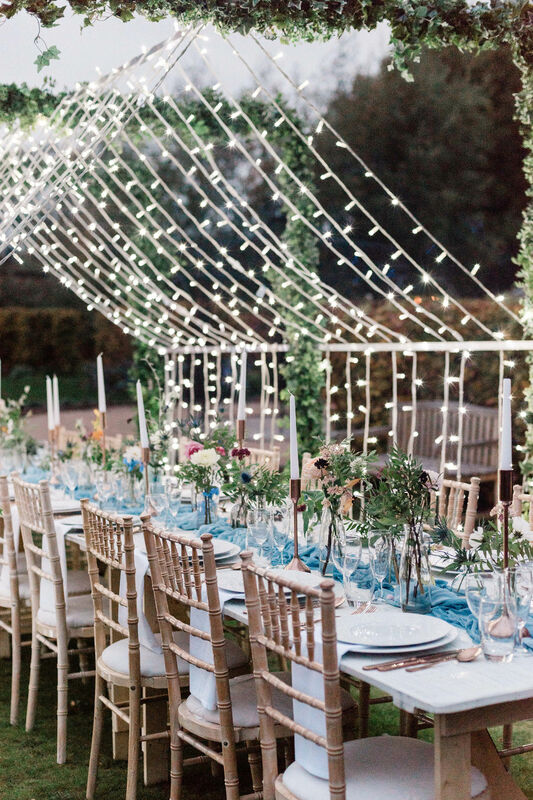 Lorien and I worked together to source an amazing team of creative suppliers who worked incredibly well together. The dress was a focal point and a priority for us both. 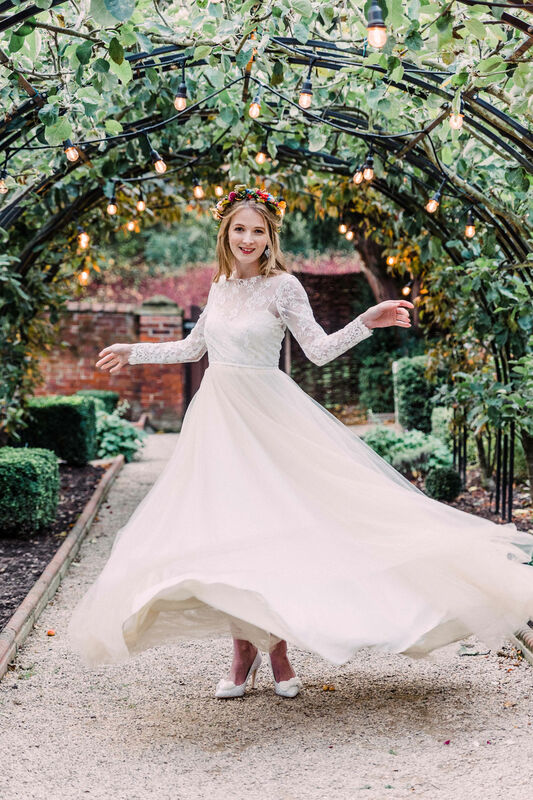 We were keen to have some subtle colour in the dress and plenty of tulle. 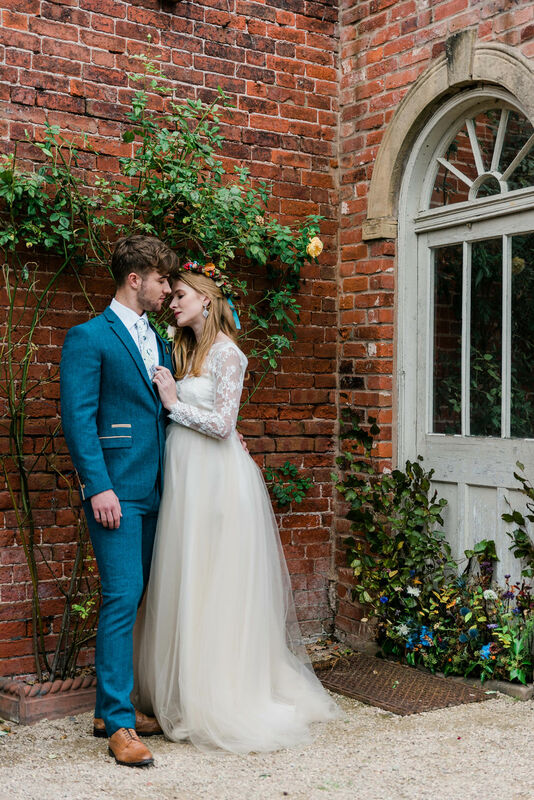 The ‘Bille’ dress supplied by E & W Couture fitted the bill perfectly. The 4 layered full circle skirt has a peachy tone which complemented the autumnal colours. 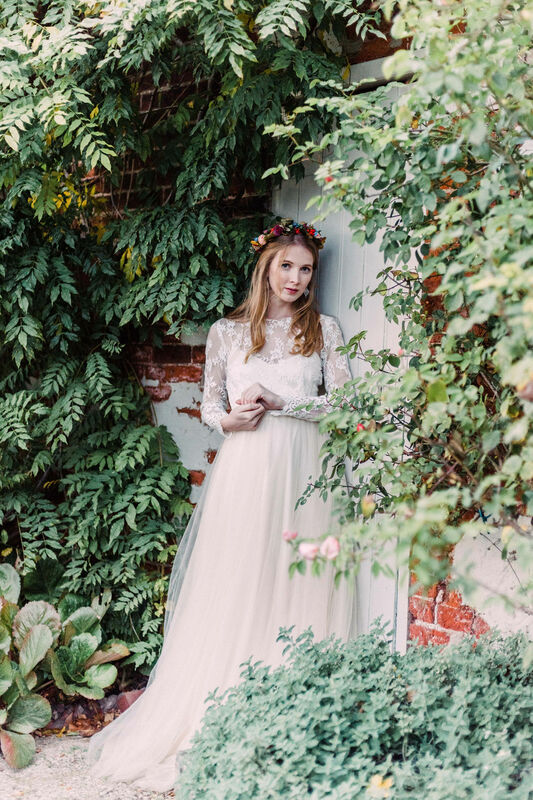 Coupled with the long sleeved lace bodice it’s a great choice for an autumn wedding. I was thrilled when Rachel Simpson Shoes agreed to provide some shoes for the shoot. I love the image of the shoes against the wooden door in the garden. 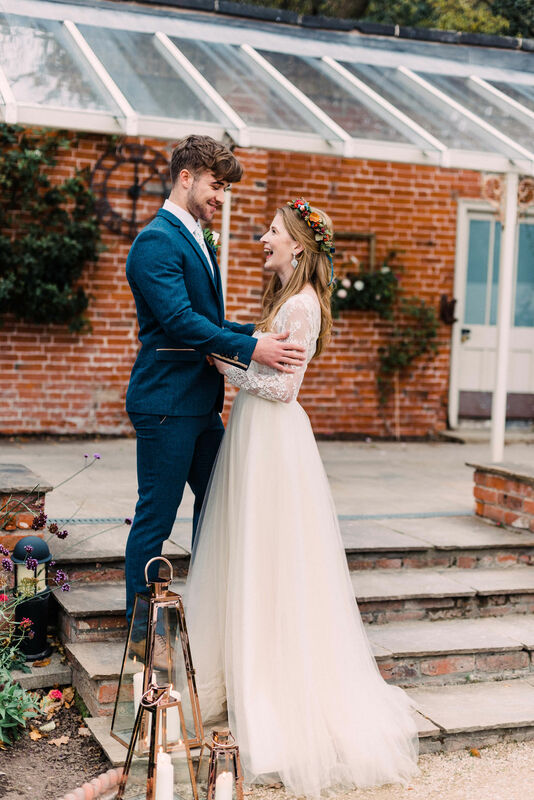 The bride’s hair and make up were beautifully styled by Adele Coxon and were the ideal complement to the dress. 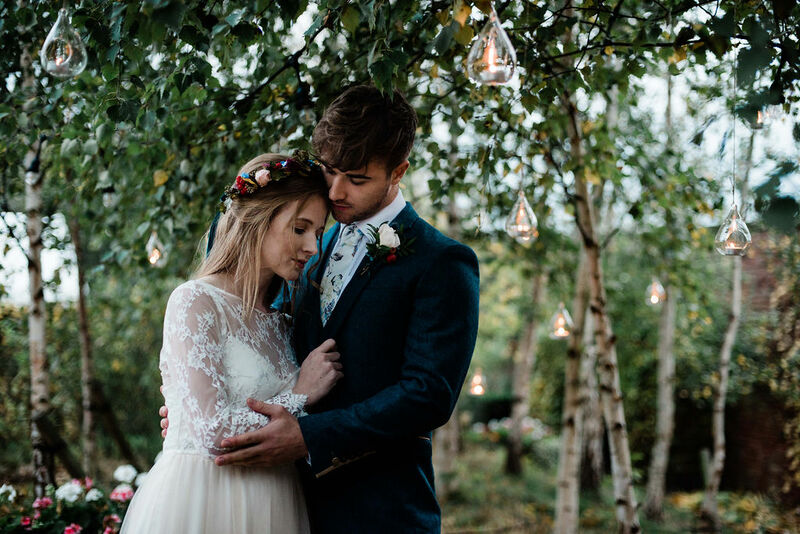 The addition of a silk garter from Extra Special Touch and statement earrings from Starbox Wedding completed the bride’s look. We hit an issue with our menswear supplier a few weeks before the shoot. But thankfully Blidworth Menswear were only too happy to help us out. 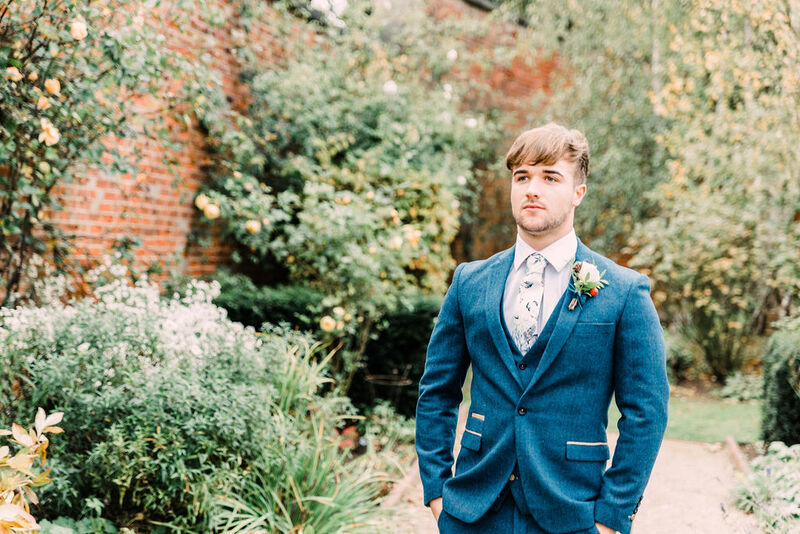 They supplied a gorgeous blue Mark Darcy 3 piece suit which matched the blues in the flowers perfectly. 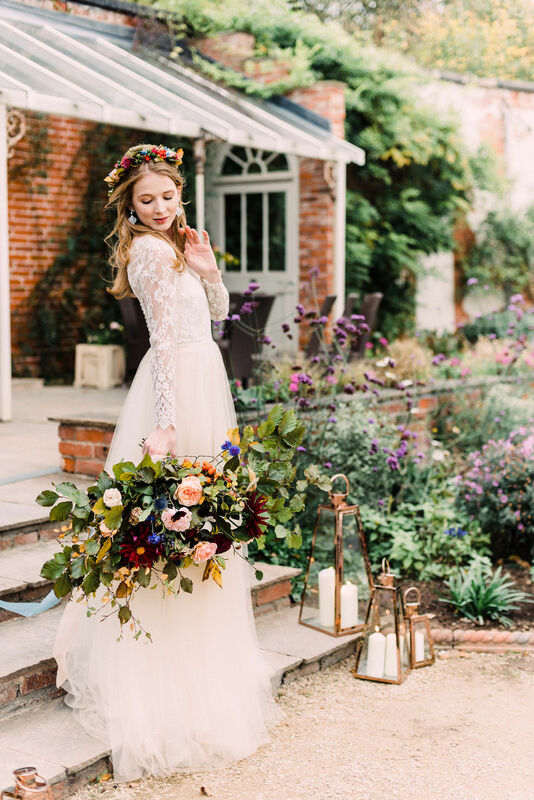 The flowers for ‘An Autumn Romance in the walled garden’ were created from blooms grown by Frances and Rose at their sheltered plot in the Peak District. 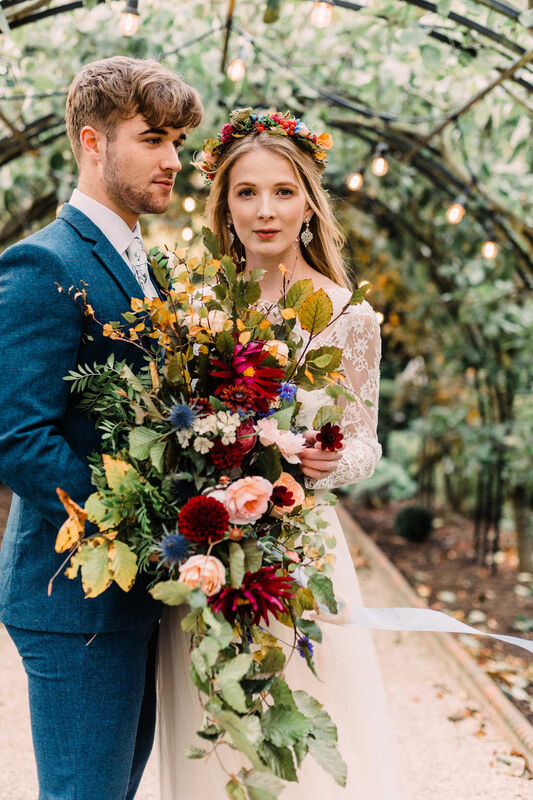 Fresh and dried elements were used to create the hues of Autumn, with foliage and seed heads to add texture and drama to the arrangements. 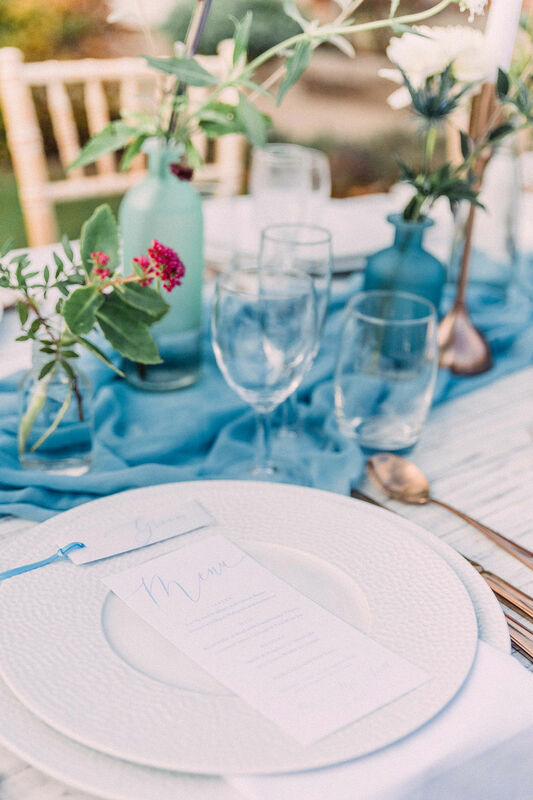 We decided on a hint of blue to pop against the more subtle reds, oranges and browns and brought the blush of the dress out with statement roses. Apples and berries were also a feature of the styling, really bringing together the best of Autumn! I’m sure you’ll agree the bouquet was a masterpiece and was further enhanced with hand dyed silk ribbons from C Fleurs Design. Lorien, as always, designed a stunning cake. 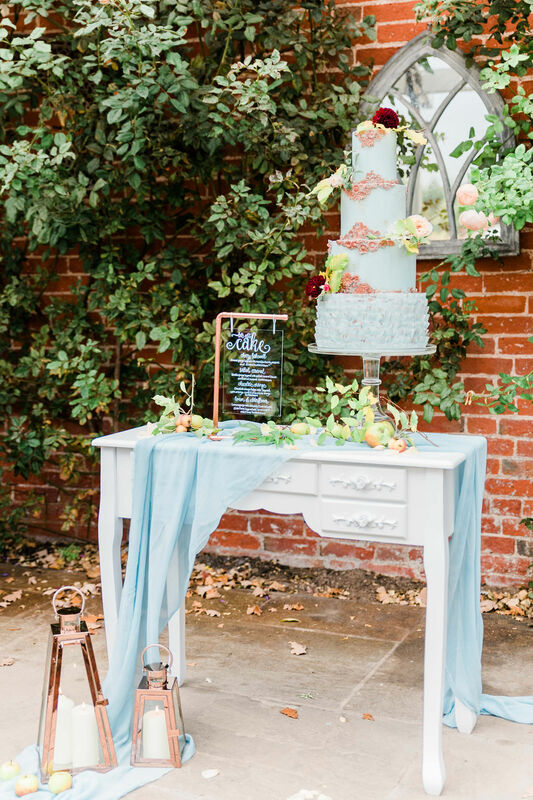 The pale blue with copper details was perfect for the theme and was further enhanced with fresh flowers and fruit. It looked incredible on the dresser, in front of the mirror in the garden,. 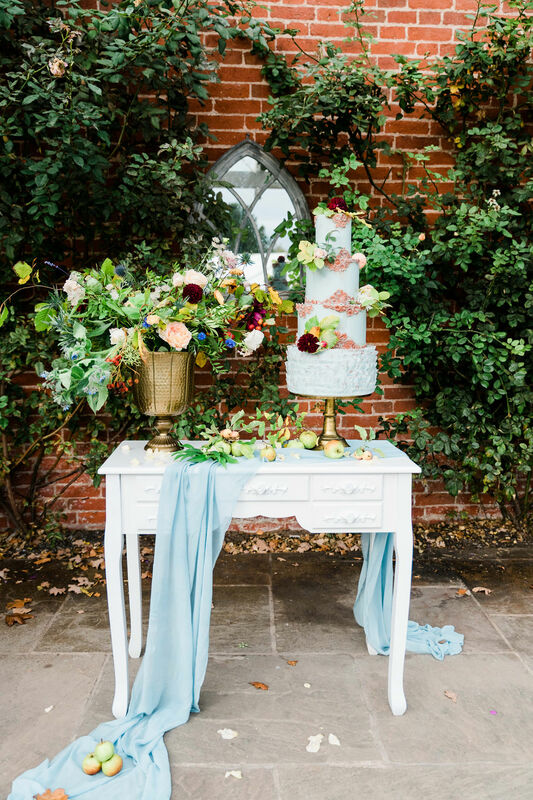 We added a fab flower urn and styled the table with a silk runner and more fruit. When our stationer dropped out just a couple of days before the shoot, I really thought we would have to re-arrange the shoot. But thankfully 2 amazing ladies came to our rescue. Katie from The Ivy Cottage stepped into the breach to make the fabulous acrylic seating plan and cake menu with literally a few days notice. I had given up hope of being able to include them in the shoot but she made it seem so easy! 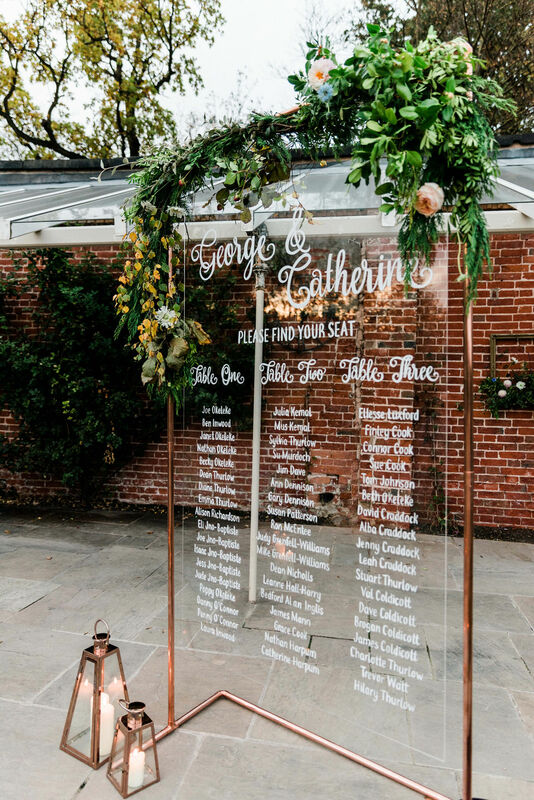 They both looked incredible in the garden on their copper frames. When it came to designing the table setting, I wanted to use long trestle tables. 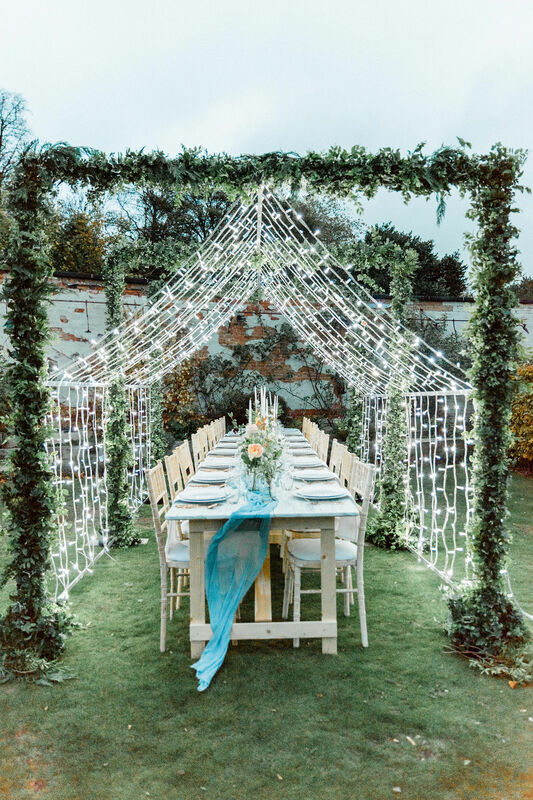 The limewashed tables from Be Event Hire were the perfect choice for the garden setting. I added white crockery with copper cutlery from Whitehouse Crockery. Heidi from Extra Special Touch provided the soft cotton napkins which draped beautifully from the tables. 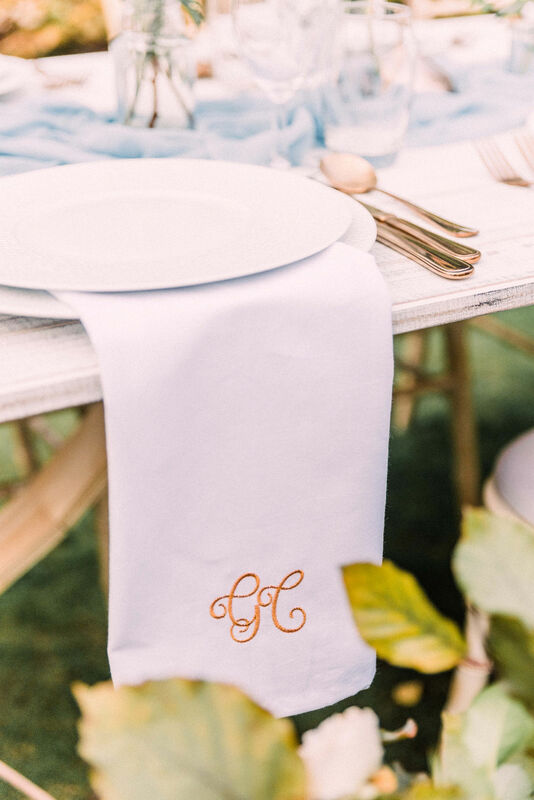 Heidi embroidered the couple’s monogram in copper thread to tie in with the overall theme. 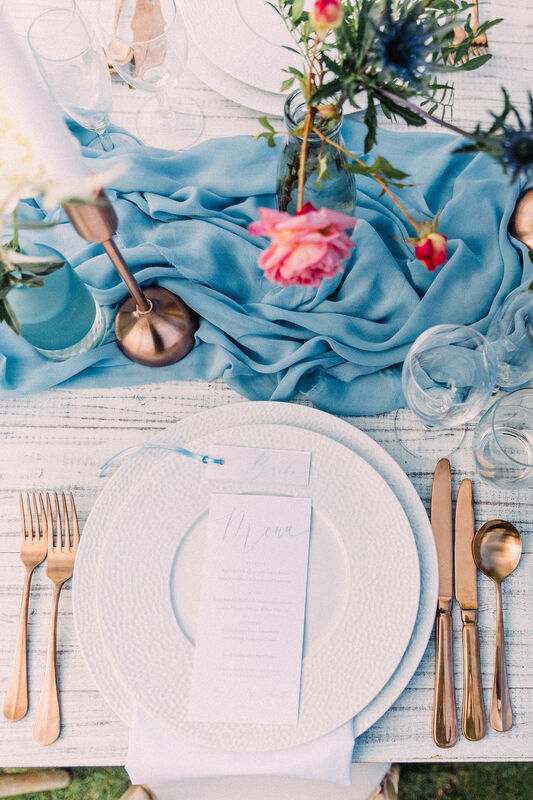 I knew that I wanted to include silk table runners to bring softness to the table setting. I knew it was a big ask as I needed 3 really long runners so I was ecstatic when Corette from C Fleurs Design agreed to supply them. The colour was perfect and they looked fantastic against the white tables. 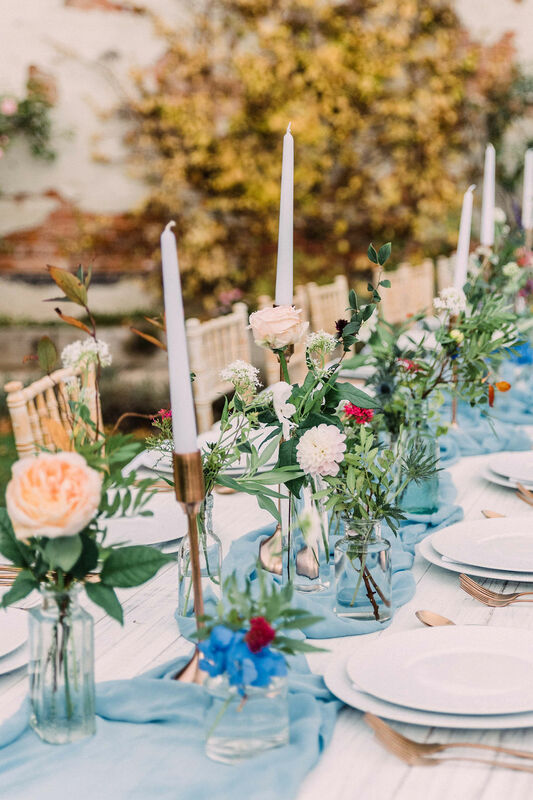 I then completed the look with my copper candlesticks, white candles and plenty of small flowers vases from Frances and Rose. One of the big things that we really wanted to achieve, but were worried it would be too much to ask, was over table lighting. I contacted Jan at Fabric Theatre and despite a broken wrist she created the amazing light installation over the tables. The lights looked absolutely beautiful in the twilight as the day drew to an end. We added further subtle lighting in the garden with hanging tea lights in the trees and my copper lanterns on the stairs. I loved working with this fabulous team and I’m so happy with the outcome. I hope you love it too and it gives you some inspiration for your wedding day. If you’d like some help to create a look like this, get in touch. I’d love to hear from you and see how I can help with your wedding plans.